My Tampa Bay Mommy : Michaels Cyber Monday Deals & Doorbusters = 100pc Art Set $1.99 & 30% off Entire Purchase Including Sale & More! Michaels Cyber Monday Deals & Doorbusters = 100pc Art Set $1.99 & 30% off Entire Purchase Including Sale & More! WOW! 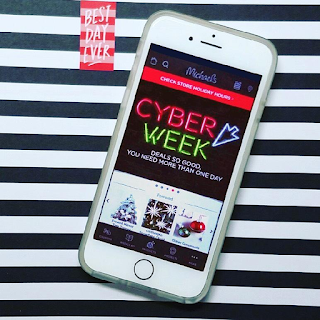 If you're a crafter, you'll want to hurry over to the Michaels Cyber Monday Sale. Today (11/28) only, save an additional 30% off all online purchases including sale items with code: MONDAY30W. Plus, use code: CYBERFREEW for FREE SHIPPING.